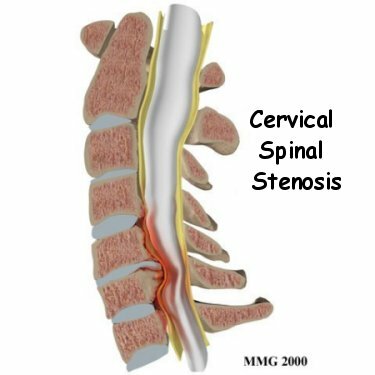 Cervical spinal stenosis is the narrowing of the spinal canal in the neck. The spinal cord is a collection of nerves that runs through the spinal canal from the base of the brain to the lower back. These nerves allow us to feel, to move, and to control the bowel and bladder and other body functions. In cervical spinal stenosis, the spinal canal narrows and can squeeze and compress the nerve roots or it may irritate or injure the spinal cord itself.